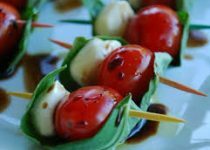 "This is a great, easy finger appetizer. Putting the same ingredients on a toothpick yielded great results." Garlic Vegetable/Salad Splash - 3 Tbsp. 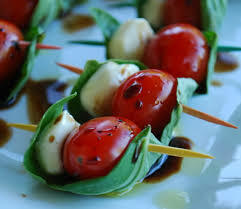 Thread a tomato half, a small piece of basil leaf, and a mozzarella ball onto toothpicks until all ingredients are used. Drizzle the garlic veggie splash over the tomato, cheese and basil, leaving the end of the toothpick clean. Sprinkle with garlic scape sea salt & fresh ground pepper. Serve immediately. Just served these little beauties and the Ladies Night Out at Anna’s Flowers in Leamington with the Garlic & Scape Kale Pesto mixed with some mayo. Applause all around!